Jonathan Brackley and Sam Vincent tell Michael Pickard how they transformed a Swedish sci-fi thriller into Channel 4’s biggest original drama for 20 years. 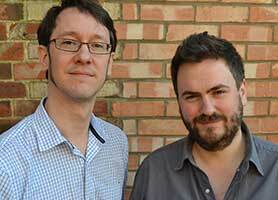 From spies to Synths, Sam Vincent and Jonathan Brackley can now be considered among the top writing talents in the UK after building a career across television and film. Best known for running BBC1 spy drama Spooks for its final two seasons, they also brought the series to the big screen earlier this year in Spooks: The Greater Good. For their latest project, the longtime collaborators are behind Humans, an eight-part sci-fi thriller that has become Channel 4’s biggest original drama in more than 20 years. Based on the Swedish series Real Humans (aka Äkta människor), it is set in a parallel present where the latest must-have gadget for a busy family is a Synth – a life-like humanoid. 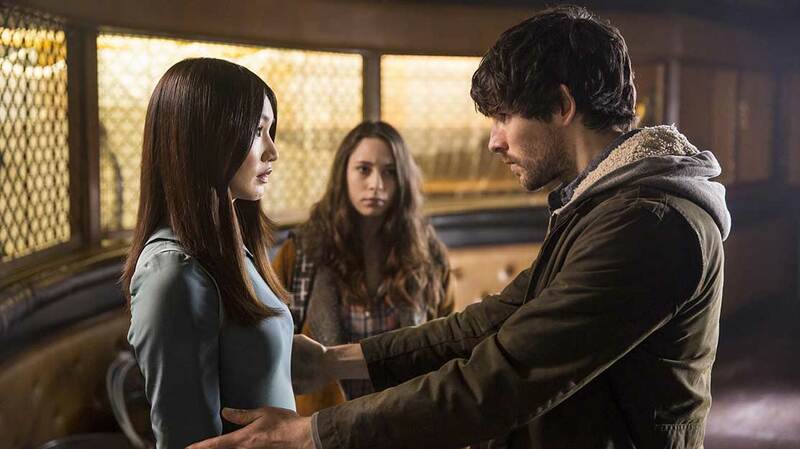 Featuring a cast including William Hurt, Katherine Parkinson, Gemma Chan, Colin Morgan, Emily Berrington and Neil Maskell, the debut episode drew a consolidated audience of 6.1 million viewers. The drama represented an interesting challenge for Vincent and Brackley, who were brought on board by Kudos (Spooks, Broadchurch) to pen the series after the producer won a battle for the format rights. US cable network AMC later joined the series as a coproduction partner, with the show debuting stateside two weeks after its UK launch on June 14. Brackley says: “We’ve worked with Kudos for the last couple of years, doing the last two seasons of Spooks and the Spooks movie. We got a call from (former Kudos CEO) Jane Featherstone, who said they’d just won a rights battle to this Swedish series about robots and wanted to know if we’d be interested. So we said yes. In particular, Vincent says it was the drama’s unconventional take on artificial intelligence and how this could be placed at the heart of a family drama that attracted the pair to the series. Vincent and Brackley watched the first season of Real Humans twice, and then pushed it aside, fearful of relying too much on the source material and simply translating the original series, rather than putting their own stamp on its themes. The writing pair had not adapted a foreign-language drama before, but compared the process to joining Spooks after it had already been on air for eight seasons – taking over an established set of characters and taking them in a new direction, while retaining the show’s original spirit and tone. A second season is yet to be confirmed, but the ratings success of the first season suggest it’s more a matter of when than if. And it’s that success that Vincent and Brackley believe justifies the decision to remake Real Humans in the first place. Having previously adapted another Scandinavian drama, the worldwide smash hit The Killing (aka Forbrydelsen), AMC was a natural US partner for Channel 4. Vincent admits he and Brackley were slightly overwhelmed at the prospect of working with the network, which counts Mad Men and The Walking Dead among its biggest hits, but says AMC were “incredibly supportive” and were fans of the show’s UK identity – ruling out fears that the show might suddenly be transplanted to a US location. As for the key to making a successful remake, Vincent says writers have to steep any adaptation in cultural relevance: “Real Humans has a great universal concept but a lot of it is quite culturally specific. We wanted to turn the lens of the concept onto an English-speaking culture and Britain today, and that produced a lot of subtle and interesting effects and differences. Before putting pen to paper, however, Brackley and Vincent both met with the show’s original creator, Lars Lundström, to discuss the series and how they might adapt it for a new audience. Lundström says the idea of blurring lines between humans and robots was something he’d been working on for several years, and had pitched to a few producers before it was picked up by Swedish pubcaster SVT. Real Humans first aired in 2012, running for two seasons. Of his meeting with Brackley and Vincent, Lundström says: “We spoke about the DNA of the show, but the storyline is up to them. We were speaking about what I thought was the bottom line of the show, and it was very fruitful. They’re two very intelligent writers so they picked it up and shaped it nicely. “One thing to be clear about is the hu-bots (as Synths are called in the Swedish version) are neither bad nor good. They’re just something humans have created, so it’s not like other AI shows where they are purely bad and we have to destroy them. That makes it a bit more complex and complicated than other similar shows, and that was very important for me. It’s a show that explores interaction with technology and what it means to be human. It’s not really about robots; it’s about humans. Lundström – who is now working on new “mystical thriller” 1001 for Gaumont International Television, Matador Film and Eyeworks Scandi Fiction – has written a storyline and some scripts for a third season, but says these are now unlikely to come to air.